AGS-Protector Tis an environmentally friendly, fast drying and transparent separation layer system for the most common surfaces: brick concrete, natural stone and other masonry surfaces. The anti-graffiti effect is achieved immediately after drying the product. AGS-Protector T belongs to the class of victim systems. After removing the cleaned areas with AGS-Protector T are new to protect. .
AGS-Protector P is a reliable permanent graffiti impregnation, etc. for surface protection to concrete and other absorbent mineral surfaces such as brick masonry, natural stone. The product creates a matte, transparent (colorless), breathable, water vapor permeable and UV stable protective impregnation with anti-stick effect and hydrophobic and oleophobic properties. AGS-Protector P is an authorized graffiti protection of the Community Anti-Graffiti eV Berlin under the BAST (Federal Highway Research Institute). AGS-Protector S is an eco-friendly, transparent and quick drying impregnation for the most common surfaces: brick concrete, natural stone and other masonry surfaces. The anti-graffiti effect is obtained after the product is well dried. 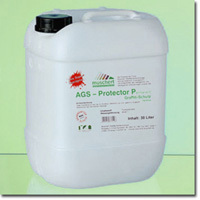 With AGS-Protector S also the absoption of water and pollution decreases. After application of AGS-Protector S covers porous surfaces with a macro moleculary protection, which takes over the distribution of water vapor. 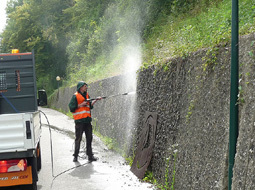 AGS-Protector GR 700 Gel is an environmentally friendly graffiti remover. 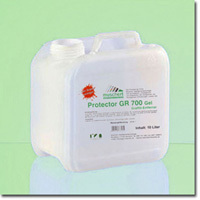 Cleaner Protector GR-650 is a fast-dissolving cleaners to remove graffiti on AGS Protector permanent. For the protection and maintenance of facades and walls of stone or wood, we use a special graffiti and weathering prophylaxis. 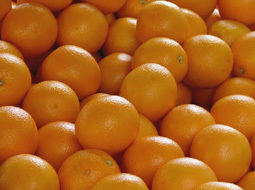 The product is reported to be readily biodegradable and the Federal Environmental Agency. (Federal Highway Research Institute listings) The environmentally friendly water-based wax emulsion is a mixture of wax emulsion, acrylic copolymer dispersion and care components. Through a vapor-permeable neutral intermediate layer, the coating holds excellent environmental influences and is transparent after application. The product was made by the "e Community Anti-Graffiti V." checked and controlled. The cleaners we use are mostly processed by Jos low-pressure process. The products are readily biodegradable and reported to the Federal Environment Agency. Our eco-friendly surface cleaner with bad grease and lime expectorant are suitable for Industry and Commerce as well as for use in household and. The mixture of orange peel oil, emulsifier and wash alcohol dissolves varnish (graffiti), lime and organic substances and has been through the "e Community Anti-Graffiti V." tested. When water repellency we work with three different products. Two of them are based on silane (Si) (creamy & liquid) and the third siloxane (Si O) (also liquid). Due to the different consistencies of the processing are almost no limits. These products are also approved by the Federal Highway Research Institute.